The world today stands nearer to the Day of Judgment than ever. 1434 years after the migration of the last Prophet (May Allah’s Blessings be upon him), the conflict between the satan and the human being is nearing its final stage. It is therefore crucial that the world events that are unfolding themselves in quick succession be viewed by the and analyzed by the Muslims in the light of the Divine Shariah. Of the Islamic scholars who have dedicated themselves to this pristine cause is Maulana ‘Asim Umer (May Allah Protect him) whose books regarding Islamic eschatology have proved invaluable in guiding the Ummah through these troubled times. In addition, the Maulana (HA) is, by his self, part of the global Jihad caravan that is seeking to implement the Khilafah on Allah’s Earth. This article is about the state of the world before the advent of Dajjal, the false Messiah (Antichrist in the Biblical Tradition). It carries an eerie resemblance to the world we live in today. It looks as though this excerpt comes from “Third World War and Dajjal: Maulana ‘Asim ‘Umar Page 111-114 8th Edition” [p. 41]. Sadly, I lack Urdu — along with Bangla, Arabic and most everything else. That is why the Prophet Muhammad explained the Fitnah of Dajjal in great detail. So the upcoming battle will be either lose it all or win it all and that is part of al-Malhama. It will be the final battle between Kufr and Iman; it will be a battle that will give victory to this Muslim Ummah. It’s not the end of it all as you still have Dajjal, Ya’juj and Ma’juj; but that battle will be the battle that will establish the Islamic Khilafah on a global scale. So this is an indication that we are getting close to those times. Now, if we are getting close to those times, you really don’t want to be sitting on the sidelines and lose out on all of this reward in this Golden Era; because it is a Golden Era. Upon reading these ahadith, people would wish they were there; and here we are living in those times sitting on the sidelines just as Shaykh ‘Abdullah Yusuf ‘Azzam (rahimahullah) said, “The Jihad was a market that opened, people made a lot of money, and then the market closed.” It’s not going to last forever; if you sit behind, if you hesitate, if you are reluctant, then you will miss out because the chance only comes once. With such glad tidings from the Messenger of Allah [saw], the Mujahideen of Pakistan have their firm sights on freeing both India and Pakistan from the rule of the disbelieving rulers and to establish Shariah in all these lands once more. May Allah Grant victory to them! Ameen! So, if indeed these Taliban are the flag bearers mentioned in the Hadith, then they shall inshAllah march forth to and conquer Jerusalem. And this is a note to the “powers” of today. 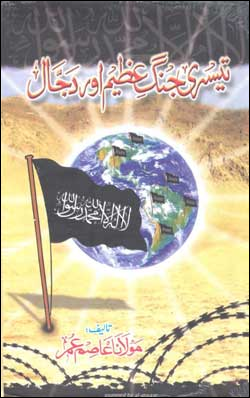 In fact, the Shariah of the Taliban gained such acceptance with Allah The Exalted, that He Made the land of Afghanistan the base for the start of the global Jihad movement. The black flags of Khorasaan became being unfurled all around and the sacred call to Tawheed (monotheism) was renewed. There is plenty more, of course, and I’ve cherry-picked the bits that bear on specific themes I have been exploring here at ZP that have end times relevance. Aaron Zelin has made a .pdf of the magazine available via Jihadology. Bahukutumbi Raman discusses it from an Indian intelligence perspective on his blog. Reuters looks at what the magazine has to say about drones. And no doubt others will be providing analysis from various other perspectives in the coming days. This entry was posted on Tuesday, May 7th, 2013 at 5:16 am	and is filed under Aaron Zelin, Afghanistan, Apocalyptic, black banner, Charles Cameron, extremists, ghazwa, India, islamist, khorasan, Mahdist, media, pakistan, Uncategorized. You can follow any responses to this entry through the RSS 2.0 feed. Both comments and pings are currently closed. 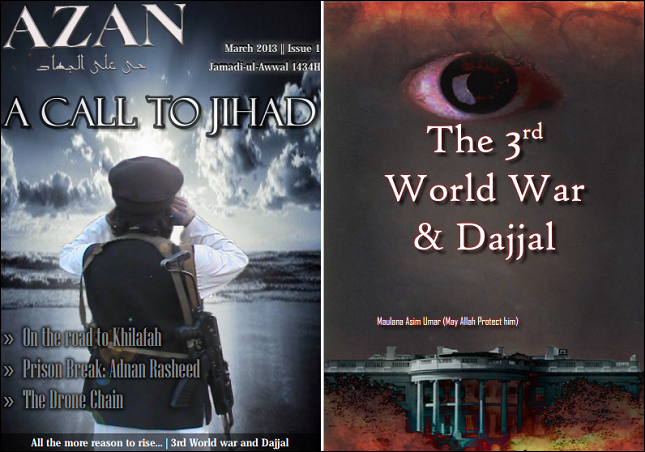 Although it [ie Azan] is attempting to emulate the look and feel of Inspire, the al-Qaeda magazine once published by American zealot Anwar al-Awlaki in the Yemen, it is nowhere near as sophisticated or engaging. Long articles about the ‘End Times’ that read like Christian fundamentalist poppycock, and badly-researched articles on drones are not likely to impress. So it would seem many neocons would rather side with the occasional Islamist/wandering jihadi than the hated Vlad the Bad. Again, it is the thicket of unanswered and awkward questions for our government — and the stupidity of a press that tries as hard as it can to deny reality in certain cases, including the DHS mass bullets order — that gives folks like Jones and Beck their profitable niche. As with similar Christian prophecy, I’m always amazed by the utilization of skepticism to reinforce a dogma. Prediction of the power of propaganda, confusion over true words and false words or true prophets and false prophets—these always suggest that the false ones will be so very f-ing effective, people will be mislead in large numbers. And those hearing these warnings treat the warnings with reverence: effective warnings. They have no thought that these warnings might mislead, that these prophets yelling Beware! might be the false prophets, the propagandists. But of that day and hour knoweth no man, no, not the angels of heaven, but my Father only. But as the days of Noah were, so shall also the coming of the Son of man be.For as in the days that were before the flood they were eating and drinking, marrying and giving in marriage, until the day that Noah entered into the ark, and knew not until the flood came, and took them all away; so shall also the coming of the Son of man be. Then shall two be in the field; the one shall be taken, and the other left. Two women shall be grinding at the mill; the one shall be taken, and the other left.Watch therefore; for ye know not what hour your Lord doth come. Men ask you of the Hour. Say: The knowledge of it is with Allah only. What can convey (the knowledge) unto thee? It may be that the Hour is nigh. Ah, so Islam also says that prediction of the End is impossible for any human. The final, difficult question remains to be answered: when will the Day of Wrath come? When will Allah destroy the abomination of desolation? When will the chains of Jerusalem be broken, and its rights returned? Therefore the end – or the beginning of the end – will be 1967 + 45 = 2012, or in lunar years 1387 + 45 = 1433. This is what we hope will happen, but we do not declare it to be absolutely certain, but if the fundamentalists would like to bet with us, as Quraysh did with Abu Bakr concerning the Qur’anic prophecy concerning the Romans, then without doubt they will lose, although we cannot guarantee that it will be that exact year! I suppose that the effort to make the End seem imminent results from a desire to utilize those now alive and hearing the warning. “Now, if we are getting close to those times, you really don’t want to be sitting on the sidelines and lose out on all of this reward in this Golden Era…” —after all, if the time and place are entirely unpredictable, sitting around or doing other things with your life might be more appealing, especially if those other things are naturally appealing. There is another potential motivation at work: the attempt to hasten the End. —which, to me, seems rather presumptuous. Stephen O’Leary has the rhetorical force of imminence covered in his book, Arguing the Apocalypse: A Theory of Millennial Rhetoric, and Damian Thompson shows how members of a congregation may pay lip service to the idea but carry on pretty much regardless in his Waiting for Antichrist: Charisma and Apocalypse in a Pentecostal Church. As for hastening the apocalypse — that’s something I’ve been trying to keep an eye on [1, 2, 3, 4 and probably elsewhere], but really need to work up into a full-scale comparative survey, time permitting, insha’allah and the creek don’t rise.